Roberto Firmino’s time at Liverpool has always been a blinding example of the need for patience in football. The Brazilian arrived from Hoffenheim in the summer of 2015, but for the first six months in a red shirt, his performances largely generated nothing more than apathy. Excitement over signing one of the Bundesliga’s best talents soon gave way to uncertainty over his suitability to English football as then-manager Brendan Rodgers had little idea over where to play the Brazilian, while there was little sign of any on-field chemistry with striker Christian Benteke. True to the age-old practice of shifting talented and mercurial players into safe, wide positions, out of harm’s way, Firmino was used all the way along the right channel with indistinct results before a back injury removed him from the conversation altogether. Here, our friends at Football Whispers look at how Firmino’s tactical versatility embodies Klopp’s philosophy of a multi-functioning, fluid team. But then Jurgen Klopp’s appointment coupled with the player’s return from injury saw him gradually emerge as a key asset. Shifted into a false 9 role, with Coutinho and Adam Lallana either side, he developed a goalscoring touch and appreciation of his talents. It had taken three years but Michael Edwards and the rest of the transfer committee’s vision had been realised. Except, for all his excellence, there’s an argument that the best of Firmino is still to come, with the first shred of evidence appearing during the 4-0 win over Red Star Belgrade in the Champions League. Klopp’s mission this season has been to integrate greater fluidity into the team, in selection, formation and positionally and the tie at Anfield saw the Brazilian occupy a playmaking role, behind Salah, in a 4-2-3-1. The stage was set in the opening minute as he dropped deep, ten yards inside the halfway line, to receive Andy Robertson’s throw-in and win a foul. Thereafter he constantly adopted a position behind Liverpool’s front two and looked to be a first passing option for his teammates when attacking. Across the 90 minutes, he enjoyed 75 touches of the ball. In the two most recent games where he completed a full match as a central striker, away at Napoli, he had 45 in each. Unsurprisingly, his passing numbers were significantly increased: 57 against Red Star – his highest of the season – against an average of 32.3 for the entire campaign. In fact, since he’s been a Liverpool player his highest was the 44.1 he managed in 2016/17. It’s a huge change of emphasis from Firmino being the furthermost point of attack, and therefore occasionally on the fringes of games, to having an integral role in shaping Liverpool’s offensive play. It wasn’t always perfect, as the Brazilian’s propensity for little flicks off his heels to set up 1-2s in the final third often saw possession surrendered, but then that’s part of the package and you want a playmaker to be creative. 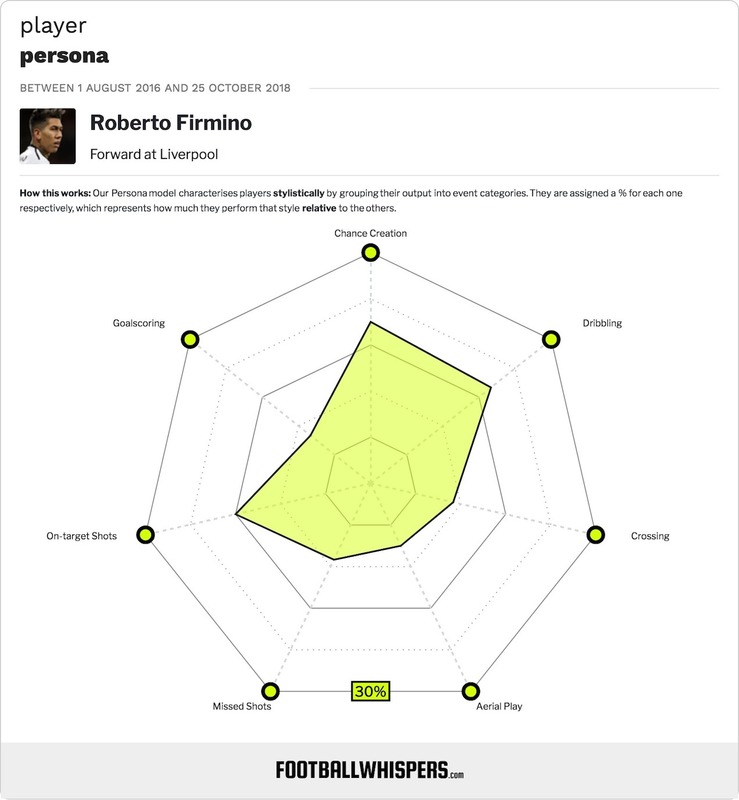 It’s interesting because it’s a revisiting of Firmino: the Hoffenheim years, where he played as a No.10 or secondary striker, as opposed to the primary frontman and was, more often than not, deadly in Germany’s top flight. In the 2013/14 season, he scored 16 goals with 11 assists in 33 appearances and averaged a key pass every 42 minutes. Bar the volume of assists in the league, he has hit those numbers with Liverpool but largely as a striker, not playmaker. Five years older, more experienced and attuned to Champions League and Premier League football and with Salah and Mane ahead of him, his chance creation in that position could be enormous. In mitigation, Red Star at home isn’t the best environment to offer a complete analysis of his suitability in the position moving forward but it has, just as everyone has anticipated would happen post-Champions League final, given Klopp another option. Liverpool no longer need to be wedded to his 4-3-3 with increasing flexibility across the park: both Firmino and Mane have now been successfully used in a 4-2-3-1 as playmakers, or they could perform the role in a midfield diamond. The former’s defensive attributes and overall work rate off the ball, in particular, make him an ideal candidate. As the season progresses we should not only see more formation changes before matches, but also during, as the trademark front three can be altered not just to the opposition but also the in-game situations. Slowly but surely (and we are not yet in November) Klopp is coaxing a different identity out of his team beyond the brutal attacking pace that symbolised 2017/18. Liverpool are becoming more flexible, fluid and, ultimately, unpredictable. Proving, just like with Firmino, patience is a virtue.